Discrete diodes and thyristors for low to high-power applications. A wide range of case designs are available in voltage classes from 200V to 8000V and current ratings from 1A to 7500A. Discrete components are used in a wide variety of applications. Particular benefits are achieved whenever high current, uncommon topologies, natural cooling or stability in harsh conditions are required. The SEMIKRON portfolio includes axial leaded diodes up to 6A, diodes and thyristors in screw-fit (stud) and capsule housings for up to 7500A and 8000V and 1200A and 1800V for diodes and thyristors, respectively. Key uses include welding machines, battery chargers, electroplating, soft starters, DC motor control, AC controllers (e.g. 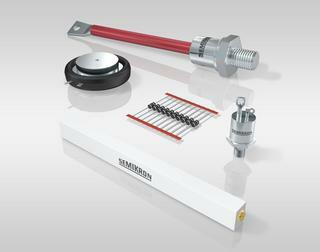 for temperature control), alternators and many more. With sealed cases, discrete devices are convenient for both natural convection and forced cooling, allowing for a broader range of applications. With over 50 years of experience in the field and millions of units produced every year, the SEMIKRON portfolio delivers competitive, flexible and highly reliable products and solutions.